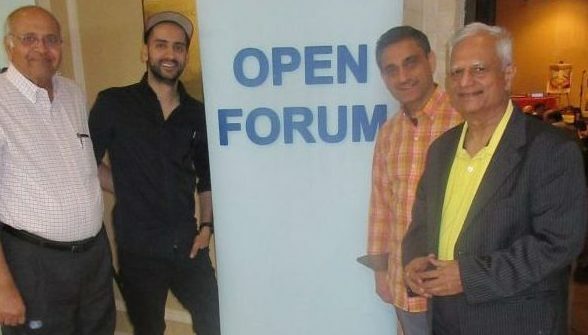 Jagat Kamdar (left) , Subodh Bhuchar (third from left) and Dinkar Chheda (right) of Open Forum radio talk show with Zahid Dewji (in hat) a local stand-up comedian. HOUSTON: A large part of the charm of these three unlikely radio talk-show hosts is that they like to mix it up on the air, even letting some local supporters sit in as the lead anchor when one of them is away. The word ‘Open’ fits their approach nicely to the free-ranging, purposely loose-knit program as they allow a free flow of ideas on the air every Saturday afternoon for two-hours. If Jagat Kamdar is the Thinker, and Subodh Bhuchar the Jester, then Dinkar Chheda is the Doer (I’ll name them collectively as “the KBC consortium “) in the most unlikely collaboration of personalities, an on-air Odd Trio. They are widely popular in the desi radio market for bringing up topics without quite drawing their own conclusions, and listeners can call to pipe in on. And so it is a mark of their popularity that for the past decade, the KBC consortium has been able to hold ‘fun raisers’ to gather funds to support the program, which runs mostly with very minimal regular marketing in an already tight desi radio show market. It’s a little like NPR with a gala mixed into it. The Open Forum Fun Raiser held this past Friday night, April 5 at the Zoroastrian Association of Houston center on West Airport Boulevard fit the personality of the KBC and the show as the setup had been stirred up from those held at the ZAH for the past four years. Guests still showed their support by writing checks and getting a load of raffle tickets (several winners were announced later in the program) and then munching on appetizers from Dawat Catering (which also served the buffet dinner, Mahesh Shah supervised it himself). Ratio2, a band rocked the lobby with Richard, Ana and of Ratio2 performed in the lobby. 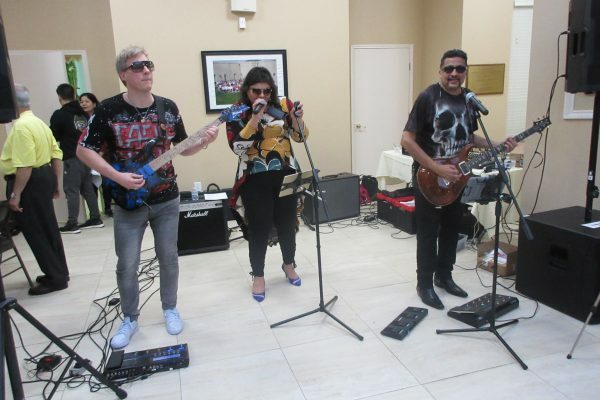 This year, as guests mingled, Ratio2, a band rocked the lobby with Richard (from Wales) and Rog (an Indian) on guitars and Ana (another Indian) doing vocals – all wearing shades – pumping up the room with songs from their CD “Without You” which they had on hand for sale. On the far side of the hall, in contrast, two teenage Indian girls – Ananya Somani, 13, and Khushi Shah, 16 – concentrated to listen to their inner force as they painted canvases (a Ganesh and a skyscape) blindfolded, a unique memorization-hand technique they had learnt from Ananya’s mother Deepa. Their final works were impressively precise and sold at the auction later in the program. To start off the KBC Consortium came onstage for brief introductions and appreciation of their major sponsors and quickly turned the mic over to Bhuchar who asked for a 10-second collective silent prayer for all those who suffer from chronic diseases. His wife Sonal, who last year actively organized the event, was absent this year and her declining health was no doubt on Bhuchar’s mind. The one thing that has been close to KBC’s heart is keeping the party humorous and once again this year they brought in a local stand-up comedian Zahid Dewji, who also is Bhuchar’s patient (“I’ve seen him in and out of his clothes – for physical checkups,” laughed Bhuchar, an internal medicine physician) and he did a 45-minute set full of shimmering anecdotes and observations. Ananya Somani, and Khushi Shah, painted canvases blindfolded, at the dinner with their moms. Following dinner, the raffle draw and auction kept everyone’s attention. 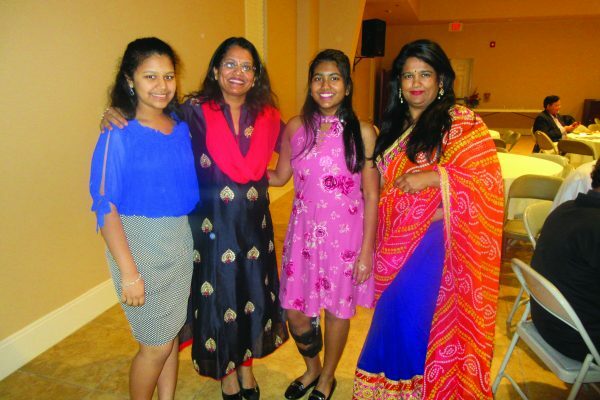 “The paintings were auctioned for $500 for both and the raffle sales netted $800 which we will donate to the Keep Us Fed charity in Montgomery County,” said Chheda. “We met our goal of raising over $50,000,” which is an amount that allows the show to coast through the year.